Do you have an excess Arm Skin? Sometimes simply dieting or exercise, or even adding a weight regimen in not enough to overcome upper arm skin that is permanently overstretched or damaged. Skin that hangs and “flaps” with every arm movement is often unresponsive to even the most aggressive gym routines. 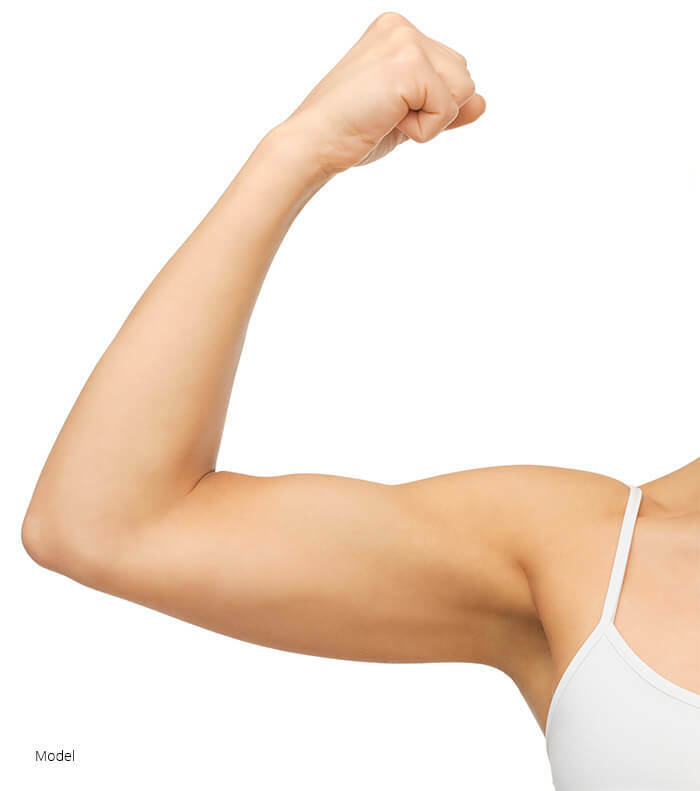 A brachioplasty or “arm lift” is a surgical procedure whereby the contour of the upper arm in enhanced by surgically redraping the skin more smoothly and tightly. It eliminates redundant excess skin and restores a more youthful, healthier appearance. An arm lift is used to restore a healthier contour to the upper arm. To eliminate excess “flapping” skin beneath the arms. To remove damaged skin resulting from weight loss or age, unresponsive to exercise or diet. A brachioplasty procedure will usually involve an incision that varies depending on the patient’s needs. If minimal skin excess is present, a limited transverse incision is made at the top of the axilla. If more skin needs to be redraped, the incision will then extend further along the inside of the arm. The surgical plan is made well in advance in discussion with your surgeon and your personal goals. Generally, the procedure length is about 1-2 hours depending of the length of the incision and performed as either an outpatient or inpatient procedure, for patient comfort. The post-operative instructions call for limited upper arm weight bearing and bandage compression wraps to minimize swelling. Commonly people are back to work in 3-7 days; more strenuous activity and exercise, usually after 2-3 weeks. Pain is treated with oral medication. Complications are rare however skin healing and scar care should be reviewed with your surgeon to minimize potential problems after the operation. Your aesthetic enhancement goals may not be met overnight, but meeting with Dr. Morales may be a good first step toward reaching them. Contact our office in Dallas, TX through our online form for details or call our office at (214) 827-8407.